Quantico Season 2 Premiere - Priyanka Chopra Packs a Mean Punch! Quantico Season 2 Premiere – Priyanka Chopra Packs a Mean Punch! Priyanka Chopra, a key ‘Quantico’ star, gave a preview of the season 2 of the film series. She was recently spotted at the 68th Emmy Awards, dazzling in a scarlet gown fashioned by Jason Wu. The fashion icon plays the role of Alex Parrish and her performace in season has been acclaimed by critics and fans alike. At the final part of season 1, Alex Parish had to be released by the Federal Bureau of Investigation (FBI), and all charges against her were terminated. The CIA accommodates her in their activities. The two government agencies responsible for maintaining law and order experience operation tensions. Parish is forced to engage in a sensitive balancing act. The first episode of the second season is titled ‘Kudove’. The teaser of the season 2 premiere indicates that Leading Lady Priyanks Chopra will proceed with fighting crime in collaboration with the Criminal Investigation Agency (CIA). In the first episode of ‘Quantico,’ Alex Parrish investigates a terrorist attack aimed at the President of the United States. The attack is to be initiated during the political summit attended by the president. Premiere Season 2 premier shows progress from the final stages of season 1. Parish has extra energy and grit. She also has a new hairstyle. The episode has the same theme as season 1, which is combating crime especially terror threats. Parish begins to investigate a hostage situation that involves the United States president and top FBI staff. The hostage takers want to secure the freedom of an Arab terrorist. The terrorist is to be exchanged with top officials of the FBI that the hostage takers captured. Season 2 will definitely be bigger and badder filled with intense drama and action. Have a look at the promo released by ABC earlier this year. 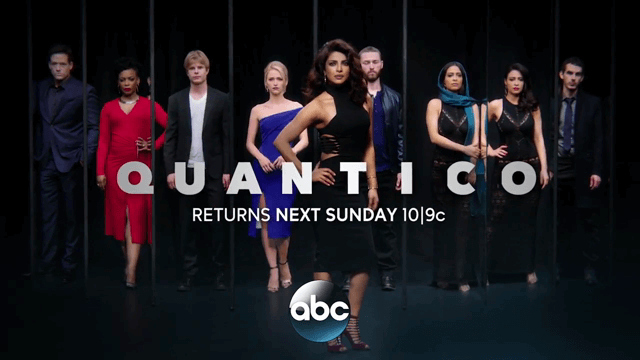 ‘Quantico’ season 2 will premiere on September 25, on Channel ABC. Cath it every Sunday at 10 pm EST.